Adopted on April 9, 2004. The blackberry, (Rubus allegheniensis,) was designated the official state fruit of Kentucky in 2004. 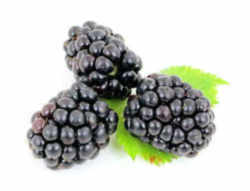 Blackberries are delicious raw and are also used in desserts, jams, seedless jellies and wine. Courier-Journal columnist Bob Hill called legislators part of the "Ding Dong School" when they passed the bill. The bill's sponsor, Sen. R.J. Palmer (D-Winchester), remembered when it passed a television reporter quipped, "The blackberry bill gets passed while the governor's budget proposal gets caught in a jam." This seems to have been a good choice because blackberries are among the easiest of all fruits to grow. Few fruits produce more dependably than blackberries. 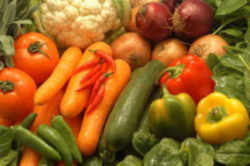 Good plants may produce crops for 15 years or more. Blackberry varieties can have a range of distinctive flavors from sweet to tart. The fruit can be used fresh, frozen, or canned, and can be made into jams or wine. Well established plants will produce about one quart or more of fruit per linear foot of row. All these features make blackberries an attractive crop for home gardeners. The word "blackberry" is properly the name of both the shrub and the fruit. 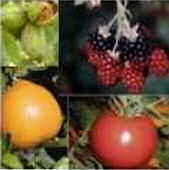 In technical botanical language, the fruit is not a berry at all, but instead an aggregate fruit of numerous drupelets. A good blackberry crop depends on bees visiting the flowers to distribute pollen grains. Fewer bee visits mean fewer drupelets per fruit. Blackberry blossoms are good nectar producers and bees who visit large acreages of blackberries will produce a medium to dark, fruity honey. 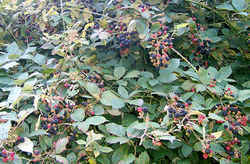 The blackberry bush has a scrambling habit of dense arching stems. Wild varieties have thorns; domestic varieties maybe thorned or thornless. Blackberries will tolerate a wider range of soil types than will most other fruits, but they prefer sandy, loamy soils with added organic matter. 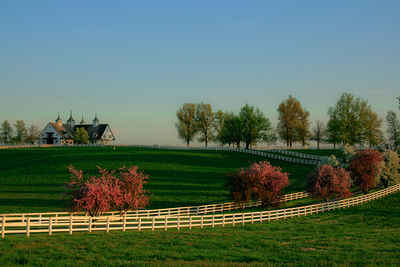 Planting may be done at any time during the dormant season, but most planting is done during February or early March. Alabama gardeners, start shopping now for cuttings of your new state fruit. Superstition in the United Kingdom holds that blackberries should not be picked after the 15th of September because the devil has claimed them then, leaving a mark on the leaves. These is some value behind this legend because after this date in the UK the wetter and cooler weather often allows the fruit to become infected by various molds that give the fruit an unpleasant flavor and maybe toxic. Palmer sponsored the bill after officials from WindStone Farms in Carlisle broached the topic. WindStone Farms grows and sells blackberries and produces blackberry jam that it sells to retailers. Palmer said the company, which was started in 1985 by Wayne Shumate, is the largest blackberry producer east of the Mississippi. FRANKFORT - Blackberries - the fruit, not the wireless technological gadget used by politicians on the go - are poised for a spot among other noted Kentucky symbols. FRANKFORT - Blackberries - the fruit, not the wireless technological gadget used by politicians on the go - are poised for a spot among other noted Kentucky symbols. A bill that would designate the juicy berries as the official state fruit of Kentucky is ready for the governor to pick it from a patch of several other measures awaiting his pen. The measure, Senate Bill 266, was sponsored by state Sen. R.J. Palmer, D-Winchester. Palmer said this was the second time he'd submitted the blackberry as a contender for the state fruit. WindStone officials could not be reached for comment. When initially approached about sponsoring the measure, Palmer said he was leery. "When someone approaches you with that type of idea, there's a hesitation," Palmer said. After learning more about the farm, Palmer felt the berry was worthy - a sentiment held for more than 50 years by the city of Carlisle where officials each year celebrate an annual Blackberry Festival. If Gov. Ernie Fletcher sees fit, the blackberry will become the only edible state symbol. Well, that's if you don't count Kentucky's official state fish, bird or wild animal. The state fish is the Kentucky bass, the bird is the cardinal and the wild animal is the gray squirrel. The bass and gray squirrel are considered dinnertime delicacies in parts of the state. The law designating the blackberry as the official Kentucky state fruit is found in the Kentucky Revised Statutes, Title 1, Chapter 2, Section 2.089. 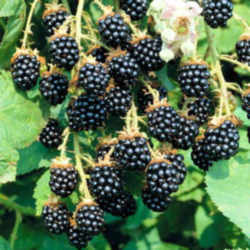 The blackberry is named and designated as the official fruit of Kentucky. 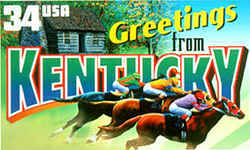 History: Created 2004 Ky. Acts ch. 114, sec. 1, effective July 13, 2004.